A special exposure to Italian finest wines and delicious dishes of the Italian tradition. 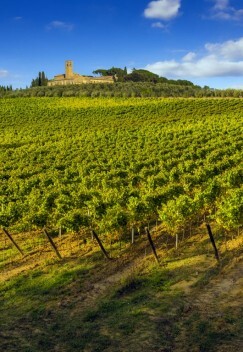 Explore Tuscany with its vineyards and breathtaking landscape. Discover the green heart of Italy: Umbria. Food and Wine will be you companions along the way! 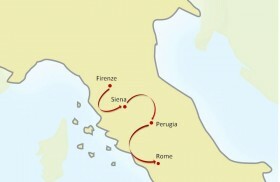 The Tour features Florence, Bolgheri, San Gimignano, Chianti, Siena, Val d’Orcia, Montalcino, Montepulciano, Perugia, Montefalco, Torgiano, Assisi and Spello. Don’t miss the possibility to enjoy the wine cellars Tours of the most prestigious wineries where the finest and top quality wines, renowned all over the world, are produced. Learn the secrets of Italian and Tuscan recipes at your exclusive cooking class in Chianti; truffle hunting in Umbria to taste this unique delicacy… Enjoy the unforgettable landscapes of Central Italy countryside, with its picturesque Medieval villages amongst olive oil groves and vineyards. LIKE THIS FOOD & WINE TOUR? 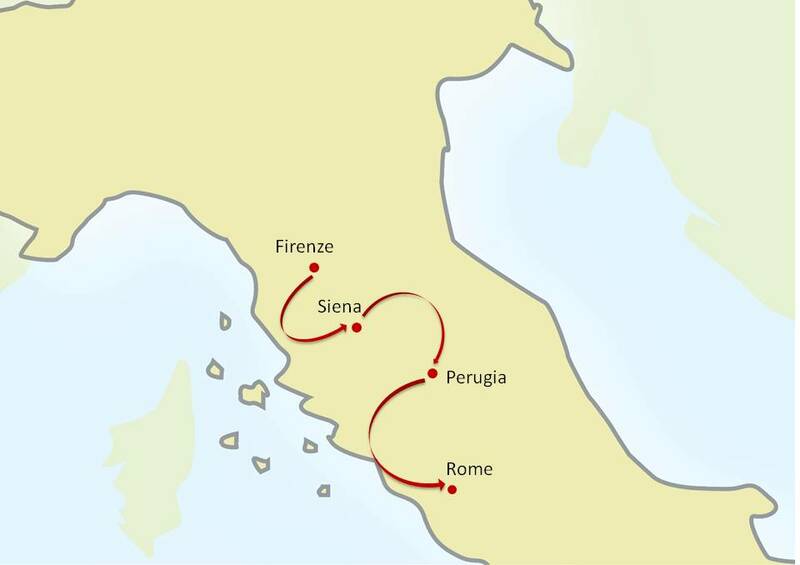 7 Nights accommodation in exclusive and fascinating 4/5 stars Hotels or Historical mansions, with full buffet breakfasts: 1 Night in Florence, 3 Nights in Siena, 3 Nights in Perugia. Welcome Dinner in Florence in an exclusive gourmet restaurant and 5 Lunches (in Bolgheri, with the Cooking Class in Chianti, an Umbrian truffle Lunch, in typical trattorias in Montepulciano and in Montefalco). Top wineries visits in Bolgheri (Super Tuscan wines), in Chianti (Chianti wine), in Val d’Orcia (Brunello di Montalcino and Rosso di Montepulciano), in Montefalco (Sagrantino di Montefalco) and in Torgiano. Exclusive Italian Cooking Class with an expert chef in Chianti. Half-Day Experience of Truffle Hunting in Umbria. Private guided Tour with English speaking Guide in Assisi. Private transfer with English speaking driver by deluxe van from the airport to the hotel. Tour begins in Florence and ends in Perugia. Exclusive Gourmet Welcome Dinner in Florence. Time to explore the city highliths: the famous Ponte Vecchio and Piazza della Signoria with Palazzo Vecchio through Via Tornabuoni and its high fashion boutiques, the beautiful church of Santa Maria Novella and the gorgeous Santa Maria del Fiore Cathedral. One day dedicated to the Northern part of Maremma, around Bolgheri, a little village became ultra-fashionable over the past 30 years with the rise of the Sassicaia and other Supertuscans phenomenon. Outstanding Tour&Tasting program in one of the most important wineries of the world with tasting of 3 superb wines and exclusive Lunch at the end of the visit. Visit another one of the pioneers wine makers of the area and taste its top wines. Full culinary experience with a private cooking class in a lovely farmhouse in Chianti. Lunch together with your chef and taste the Italian and Tuscan dishes you have prepared. Visit and wine tastings in San Gimignano, a small walled medieval hill town recognized UNESCO World Heritage Site for the uniqueness of its landscape. Full Day in Val d’Orcia: visit the iconic estate in Montalcino with an exclusive “Brunello Vertical Wine tasting”. Lunch in Montepulciano: the little village is known to produce wine as far as the Roman Empire. Follow the wine cellars Tour of a famous winery of the area and taste “Vino Nobile di Montepulciano”. Special itinerary on the Truffle Track from the digging up to its processing and cooking in the North of Umbria, famous for its delicious black and white truffles. Truffle hunting demonstration with dogs, Tour of the truffle farm, cooking demonstration held by a local chef to learn how to make a typical Umbrian/Truffle meal. Great convivial Truffle Lunch. In the “heart of Italy” (Umbria) you will visit the homeland of the worldwide famous Sagrantino wine, Montefalco. Taste it in one of the most famous wineries, renowned for their high quality wines and beautiful estate. Typical Lunch in a local “enoteca”. Visit of a family run winery in Torgiano and enjoy the beauty of the countryside, amongst olive oil groves and vineyards. Private guided Tour of Assisi, the city of St Francis with its Basilica. Centre of the Franciscan spirituality and cradle of the medieval European art, built upon the Saint’s tomb, the church is an architectural masterpiece containing some of the finest paintings of medieval Italian art, from Cimabue to Giotto. Visit the beautiful medieval village of Spello with its white and pink stone houses and the breathtaking Renaissance fresco by Pinturicchio in the Cappella Baglioni. LIKE THIS FOOD & WINE TOUR? You can customize. START HERE.